Price: $15/person. Price includes guided hike and a book about Rockland in the Revolutionary War. Pre-paid reservations are required. 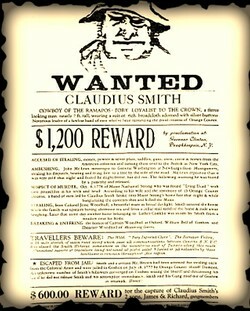 Claudius Smith, known in local lore as the "Cowboy of the Ramapos," led a Loyalist gang during the Revolutionary War that stole horses and cattle and sold them to British troops; robbed local Patriots' homes; and ambushed travelers in the "no-man's land" from Tuxedo to Suffern.In this pair of hikes, we visit mountain lairs the gang is believed to have used after raiding and terrorizing the communities in the valleys. 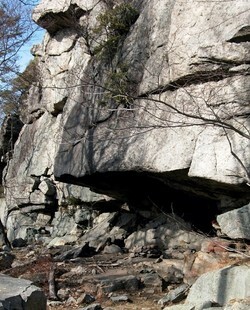 On Saturday, May 19, we will hike to Claudius Smith's Den (Harriman State Park), a large, horizontal rock shelter on the Tuxedo-Rockland border that served as a hideout for Claudius Smith and his gang. This hike will take approximately 3-3.5 hours and has steep sections. This hike is rated "moderate to strenuous." Participants should be in relatively good shape and wear sturdy hiking footwear. Bring water and lunch or snacks.